THESE ARE NEW OLD STOCK AND THERE’S #1272 PUPPY, #1273 KITTY, AND #1268 CHILD WITH TREE. KITS ARE COMPLETE AND CONTAIN 18 COUNT AIDA, DIE CUT SHAPE, LACE, FLOSS, AND NEEDLE. 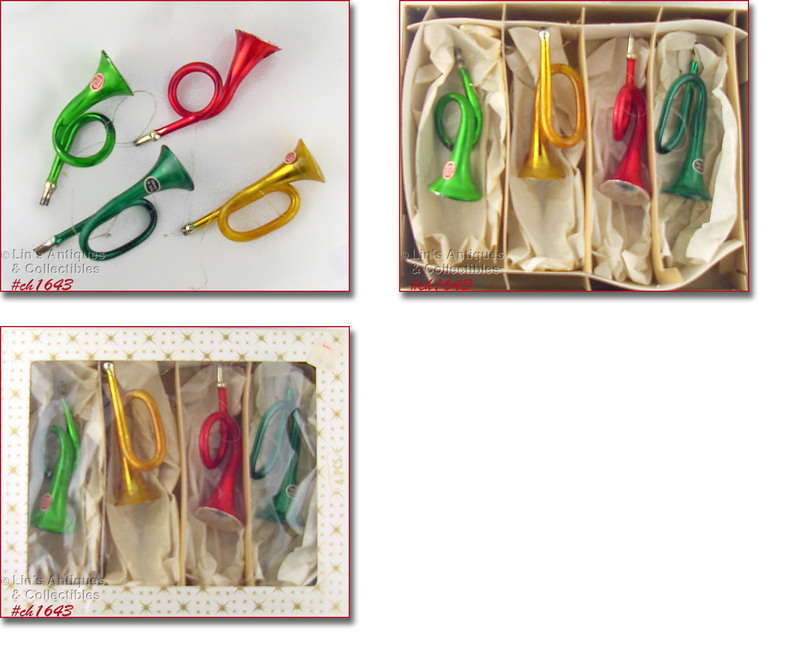 ANOTHER LISTING OF 4 VINTAGE HORN SHAPED GLASS CHRISTMAS ORNAMENTS MADE IN WESTERN GERMANY. THREE OF THESE ORNAMENTS MEASURE 6” LONG, THE OTHER MEASURES 6 1/2” LONG. THEY ALSO HAVE THE ORIGINAL PAPER TAGS – 3 HAVE MADE IN GERMANY, THE OTHER HAS MADE IN WESTERN GERMANY. THERE ARE 2 DARK GREEN COLOR ORNAMENTS, A GOLD COLOR, AND A RED. ONE HAS A METAL INSERT IN THE END OF THE HORN (IT HAS GREENED AND IS PITTED), THE OTHER THREE DO NOT HAVE THE INSERTS. ORNAMENTS ARE IN VERY GOOD VINTAGE CONDITION WITH SOME MINOR COLOR LOSS AND/OR COLOR SEPARATION. THEY ARE IN THE ORIGINAL BOX. THE BOX IS IN VERY GOOD CONDITION BUT THE CELLOPHANE HAS SOME TEARS WITH TAPE REPAIR. PER BOX: “MADE IN WESTERN GERMANY, FOR BOX SALE ONLY, DIST. BY THE GEORGE FRANKE SONS CO, BALTIMORE, MD 21201”. 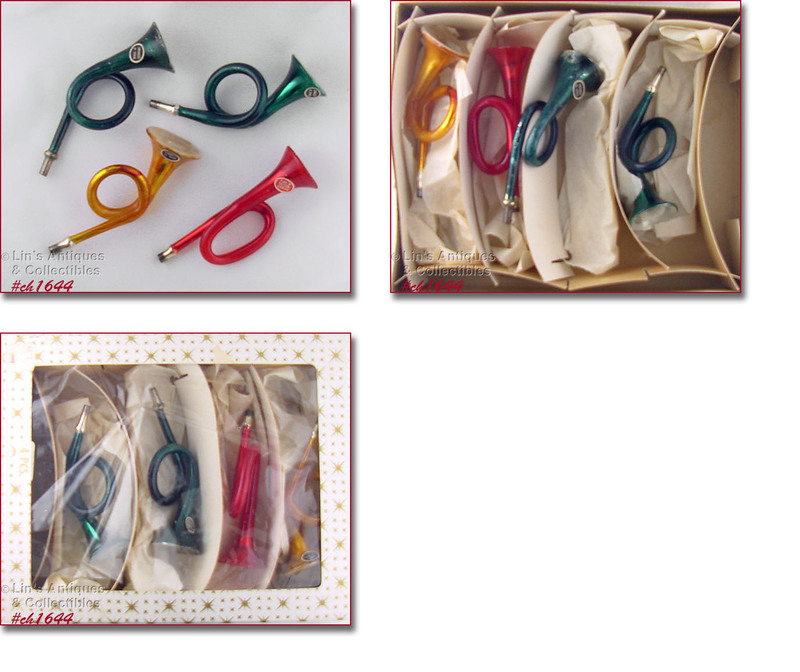 THIS LISTING HAS A BOX OF 4 VINTAGE HORN SHAPED GLASS CHRISTMAS ORNAMENTS! ORNAMENTS MEASURE 6” LONG AND ALL HAVE PAPER TAGS – 3 HAVE MADE IN WESTERN GERMANY, THE OTHER HAS MADE IN GERMANY. THERE IS A DARK GREEN COLOR ORNAMENT, A LIGHTER GREEN COLOR, GOLD AND A RED. TWO HAVE METAL INSERTS IN THE ENDS OF THE HORNS AND AS HAPPENS, THEY HAVE “GREENED” AND HAVE PITTING. I PURCHASED THESE RATHER RARE SHINY-BRITE ANGELS MANY YEARS AGO FOR MY PERSONAL VINTAGE CHRISTMAS COLLECTION. I NEVER DISPLAYED THEM – ACTUALLY JUST CAME ACROSS THEM ON A SHELF WHERE I PUT THEM WHEN PURCHASED. THESE ANGELS ARE TOO NICE AND TOO DIFFICULT TO FIND TO NOT BE ENJOYED AND APPRECIATED SO I’M LISTING THEM FOR SALE. THE ANGELS ARE IN THE ORIGINAL SHINY-BRITE BOX. THE CELLOPHANE COVER HAS SPLIT IN TWO PLACES WITH ONE BEING TAPED/REPAIRED; THE OTHER HAS NOT. THERE ARE 4 ANGELS WITH EACH HAVING A FOIL/PAPER MUSICAL INSTRUMENT. TWO IN WHITE DRESSES HAVE HARPS, PINK DRESS ANGEL HAS A HORN, AND THE BLUE DRESS ANGEL ALSO HAS A HORN. THEIR ARMS ARE CHENILLE STEMS, THEIR HALOES AND WINGS ARE GOLD COLOR ALUMINUM, THEIR DRESSES/GOWNS ARE MATERIAL WITH GOLD COLOR DOTS OVER A PAPER CONE FOR SHAPE. I BELIEVE THEIR FACES ARE CERAMIC BUT THEY MAY BE PAPIER-MÂCHÉ. ANGELS MEASURE 3 1/8” TALL. STAMPED ON THE INSIDE OF THEIR PAPER “UNDER SKIRTS”: COPYRIGHT 1959. MAX. ECKHARDT & SONS. MADE IN JAPAN. THEY ARE IN WONDERFUL CONDITION WITH NO DAMAGE. THESE ARE DISPLAY ANGELS (CENTERPIECE, MANTEL, ETC.) – NOT ORNAMENTS BUT YOU COULD PROBABLY ADD A GOLD THREAD AROUND THEM FOR HANGING. I HAVE COLLECTED VINTAGE CHRISTMAS ORNAMENTS/ITEMS SINCE I WAS A YOUNG GIRL AND THIS IS THE FIRST AND ONLY SET OF ANGELS LIKE THIS THAT I HAVE SEEN. THIS LISTING HAS NEW OLD STOCK CHRISTMAS TREE GARLAND FROM S.S. KRESGE COMPANY OF TROY, MICHIGAN! PER BOX, THIS IS A “SPIRAL TWIST GARLAND, METALIZED PLASTIC, TARNISH-PROOF, FLAMEPROOF, 18 FT (6 YDS.) X 1 IN.”. THE COLOR IS HOT PINK! THE COLOR APPEARS SOMEWHAT RED IN OUR PHOTOS BECAUSE CAMERA HAS DIFFICULTY WITH THIS COLOR (SAME WITH REALLY BRIGHT RED COLOR) BUT THE COLOR IS HOT PINK (THE COLOR THAT WAS SO POPULAR ON ALUMINUM CHRISTMAS TREES). THERE ARE 4 BOXES AVAILABLE IN THIS LISTING. 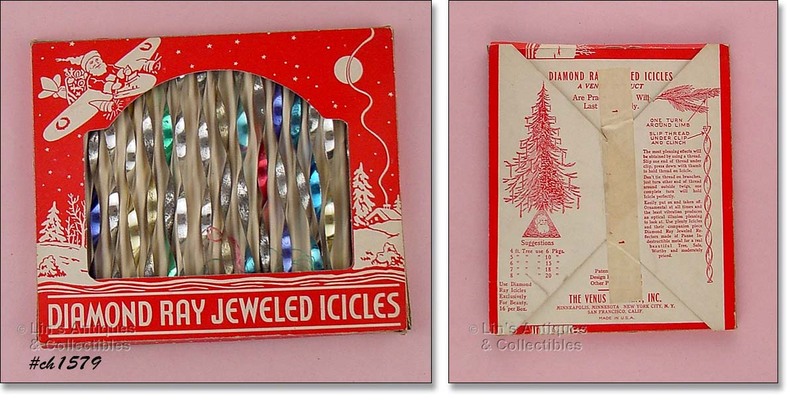 THIS LISTING HAS VINTAGE UNOPENED GRANTS LIGHTWEIGHT CHRISTMAS TREE ICICLES! PER BOX, THEY’RE 18” LONG, FIREPROOF, AND THERE ARE 650 ICICLES IN THE BOX. TWO BOXES HAVE BEEN SOLD. THE ONLY BOX AVAILABLE IS THE FIRST ONE IN PHOTO -- HAS A SPLIT/TEAR IN THE OUTER WRAPPING. YES, THESE ARE ALSO FROM MY COLLECTION! I USED TO HAVE A CHRISTMAS TREE IN THE FOYER AND ONE IN EVERY ROOM – EACH DECORATED WITH A DIFFERENT THEME. THE VINTAGE GLASS ORNAMENTS WERE RESERVED FOR MY ALUMINUM CHRISTMAS TREES (GOLD AND SILVER) WITH THESE BEAUTIFUL PINK ICICLES ALWAYS ON A SILVER TREE. AS CAN BE SEEN IN PHOTOS, THERE ARE A COUPLE SCRATCHES – NO DOUBT CAUSED BY A PRIOR OWNER STORING THEM WITH THE METAL HANGERS ATTACHED – THIS IS A DEFINITE NO-NO. THERE ARE A FEW DARK DOTS THAT ARE COMMON ON ORNAMENTS OF THIS AGE – NOTHING THAT I WOULD RATE AS DETRIMENTAL. 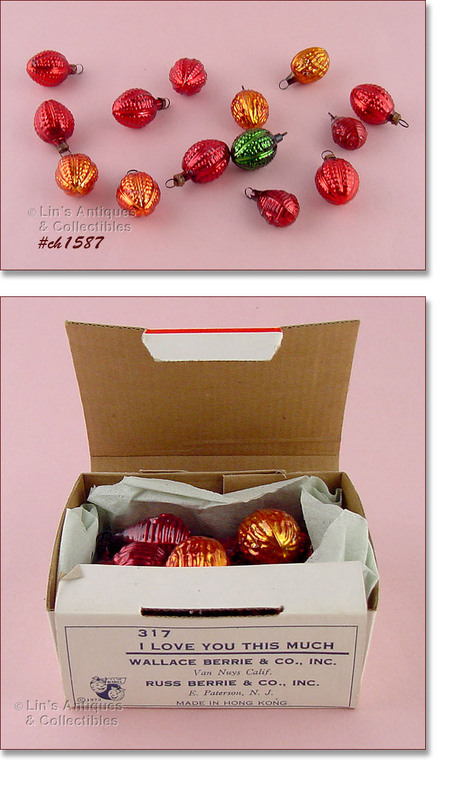 ORNAMENTS ARE IN THE ORIGINAL BOX SHOWING THE COLOR AS “CERISE”. THEY ARE THE LARGER SIZE ICICLE ORNAMENTS – 8” IN LENGTH! ORNAMENTS IN THIS SIZE AND THIS HOT PINK COLOR ARE NOT YOUR EVERYDAY FINDS! AND STILL MORE ORNAMENTS FROM MY COLLECTION! THESE ALL HAVE METAL CAPS STAMPED POLAND. THERE IS AN ASSORTMENT – MICA STRIPED ROUNDS, STRIPED TEAR DROPS, HAND-DECORATED ROUND REFLECTORS AND HAND-DECORATED TEAR DROP REFLECTORS. THERE IS A SPECIAL ONE – THE HAND-DECORATED RED ONE – THAT IS A DOUBLE-SIDED REFLECTOR. ORNAMENTS ARE HAND-DECORATED WITH FLORAL DESIGNS, BIRDS, AND THE HOT PINK ONE HAS A MAN ON AN ELEPHANT! THESE ARE SLIGHTLY LARGER ORNAMENTS. THE TEAR DROPS MEASURE APPROXIMATELY 4 ½” LONG AND THE ROUND ONES ARE APPROXIMATELY 2 ½” DIAMETER. I LIST AS APPROXIMATELY BECAUSE THERE WILL BE SLIGHT SIZE VARIANCES BETWEEN ORNAMENTS. ORNAMENTS HAVE MINOR COLOR LOSS (NORMAL FOR THEIR AGE). THE HOT PINK COLOR ONE HAS THE MOST AND EVEN THAT IS NOT DETRIMENTAL (I WOULD SURMISE IT WAS PROBABLY HANDLED THE MOST TO LOOK AT THE DESIGN OF A MAN ON AN ELEPHANT – THE ELEPHANT EVEN HAS LONG “TUSKS”). THESE ARE EXCELLENT ADDITIONS TO A VINTAGE CHRISTMAS ORNAMENT COLLECTION! MORE BEAUTIFUL ORNAMENTS FROM MY VINTAGE COLLECTION! THESE ARE ALL REFLECTORS – 4 ROUND SHAPE AND 8 TEAR DROPS. THESE ARE MEDIUM SIZE – TEAR DROPS MEASURE APPROXIMATELY 3 ½” LONG AND ROUNDS ARE APPROXIMATELY 2 ¼” DIAMETER. THE METAL CAPS ARE STAMPED USA, POLAND, OR ARE UNMARKED. SOME ORNAMENTS HAVE STRIPES WITH GLITTER ACCENTS/DESIGNS; SOME ARE HAND-DECORATED WITH GLITTER ACCENTS, ETC. ALL DESIGNS ARE LOVELY – THERE ARE FLORAL DESIGNS WITH A BELL, THE ROUND ONE WITH THE PAINTED STAR REFLECTOR (SEE PHOTO SHOWING 3 ORNAMENTS) HAS WHAT TO ME LOOKS LIKE HAND-PAINTED LILY OF THE VALLEY ON BACK, AND THE PINK AND GOLD TEAR DROP (SEE SAME PHOTO) HAS 2 HAND-PAINTED BLUE BIRDS! THESE ORNAMENTS HAVE MINOR COLOR LOSS AS EXPECTED FOR ORNAMENTS OF THIS AGE. PLEASE SEE ALL PHOTOS, THESE ARE BEAUTIFUL ORNAMENTS! THESE BEAUTIFUL VINTAGE GLASS CHRISTMAS ORNAMENTS ARE FROM MY EXTENSIVE COLLECTION – I AM LISTING OTHERS TODAY AND WILL LIST MORE AS TIME ALLOWS. THIS DOZEN IS SHOWN IN A VINTAGE SANTA LAND BOX SIMPLY TO DISPLAY THEM WHEN TAKING PHOTOS. IT IS DISPLAY ONLY – I WILL NOT SHIP THEM IN THIS BOX BECAUSE THE NECKS OF THE TEAR DROP SHAPED ORNAMENTS ARE NOT SUFFICIENTLY PROTECTED. THERE ARE 4 ROUND SHAPE REFLECTORS AND 8 TEAR DROP REFLECTORS WITH POINTED ENDS. THE POINTED ENDS VARY FROM VERY THIN AND POINTED TO THICKER WITH A NOT SO POINTED END (SEE PHOTOS). THE DESIGNS ARE HAND-DECORATED AND GLITTER ACCENTS WITH SOME ORNAMENTS HAVING SMALL AMOUNTS OF COLOR LOSS -- NOTHING EXTREME OR DETRIMENTAL TO THESE BEAUTIFUL ORNAMENTS. THE REFLECTOR PORTIONS HAVE NO COLOR LOSS AND ARE EXCEPTIONAL. THE ROUND ORNAMENTS HAVE POLAND METAL CAPS WHILE THE TEAR DROP METAL CAPS ARE UNMARKED. THE TEAR DROPS ARE APPROXIMATELY 3 ½” LONG AND THE ROUNDS ARE APPROXIMATELY 2 ¼” DIAMETER (MEASUREMENTS ARE APPROXIMATE BECAUSE THERE WILL BE SLIGHT VARIANCES FROM ORNAMENT TO ORNAMENT. I BEGAN COLLECTING THESE VERY THIN GLASS REFLECTOR ORNAMENTS MANY YEARS AGO. I CAME ACROSS THIS BOX OF ORNAMENTS WHILE SORTING THROUGH MY INVENTORY A FEW WEEKS AGO. WHENEVER I WOULD FIND ONE OF THESE ORNAMENTS, I WOULD JUST ADD THEM TO THIS BOX WHICH IS WHY THERE ARE 16 ORNAMENTS IN THIS LISTING. 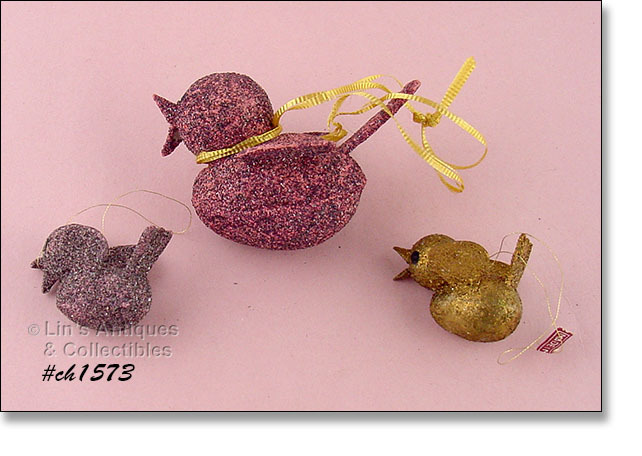 WE HAVE TAKEN SEVERAL PHOTOS FOR YOUR REVIEW – ORNAMENTS ARE AS I PURCHASED THEM. THERE ARE A COUPLE WITH PURPLE COLOR BACKS AND THE COLOR IS SEPARATING, A COUPLE OF THE REFLECTORS/INDENTS HAVE SOME DARK DISCOLORATION THAT I WOULD SURMISE WAS CAUSED BY BEING IN VERY CLOSE PROXIMITY TO A BULB. I HAVE MADE NO ATTEMPT TO REMOVE THIS BECAUSE I DID NOT WANT TO CHANCE REMOVING ANY ORNAMENT COLOR. REMEMBER THAT THESE ORNAMENTS ARE FRAGILE, THEY ARE VERY THIN GLASS – THEY ARE VERY, VERY COLLECTIBLE AND SHOULD BE ENJOYED AS IS INSTEAD OF ATTEMPTING TO MAKE THEM LOOK NEW, THEY ARE TREASURED PIECES OF THE PAST! ONE SHINY BRITE METAL CAP HAS BEEN REPLACED WITH A TIGHT FITTING ONE – I DID NOT ATTEMPT TO CHANGE BECAUSE I DIDN’T WANT TO CHANCE BREAKING THE ORNAMENT. THEY ARE IN A VINTAGE BOX BOTTOM (NO LID) AND ARE EXACTLY AS I PURCHASED THEM MANY YEARS AGO AT AN ESTATE SALE. THIS IS THE LAST OF MY PERSONAL ORNAMENT COLLECTION THAT I WILL BE LISTING TODAY. I HAVE COLLECTED OVER 40 YEARS AND THESE LISTINGS ARE JUST “THE TIP OF THE ICEBERG”. I WILL LIST MORE LATER AS TIME ALLOWS AS I GO THROUGH MY COLLECTION. THIS LISTING HAS 5 ROUND INDENT/REFLECTORS. THEY ARE IN AN AYR-WAY BOX AND THAT’S THE BOX THEY WERE WHEN I PURCHASED THEM (I PURCHASED THESE AT THE SAME ESTATE SALE AS OUR #CH1619), HOWEVER, I THINK THE RED ORNAMENT AND THE GOLD ORNAMENT WERE PLACED IN THIS BOX BY ORIGINAL OWNER AS ORNAMENTS WERE REMOVED FROM THE TREE. I DO NOT BELIEVE THEY ARE THE ORIGINAL AYR-WAY PURCHASES BUT THEY ARE BEAUTIFUL ORNAMENTS AND THEY COORDINATE WITH THE OTHER 3 SO I HAVE LEFT THEM AS FOUND/PURCHASED. I WOULD SAY THESE ARE MEDIUM SIZE, AND LIKE OUR #CH1619, THEY ARE ESSENTIALLY IN MINT CONDITION – MAY BE A DARK DOT HERE AND THERE BUT NOTHING SERIOUS, A COUPLE OF THE CAPS HAVE SOME WEAR/DISCOLORATION, NOT DETRIMENTAL. MORE ORNAMENTS FROM MY COLLECTION! THESE WERE ORIGINALLY PURCHASED AT AYR-WAY (REMEMBER THAT DEPARTMENT STORE CHAIN?) AND THERE ARE 5 LARGER SIZE INDENT/REFLECTOR ORNAMENTS IN THEIR ORIGINAL BOX. PER BOX, THESE WERE “MADE EXPRESSLY FOR COMMODORE MFG. CORP, BROOKLYN, NY 11232, COPYRIGHT”. THESE ORNAMENTS ARE ESSENTIALLY MINT CONDITION – THERE MAY BE A DARK DOT HERE AND THERE BUT NOTHING SERIOUS. MORE FROM MY COLLECTION! 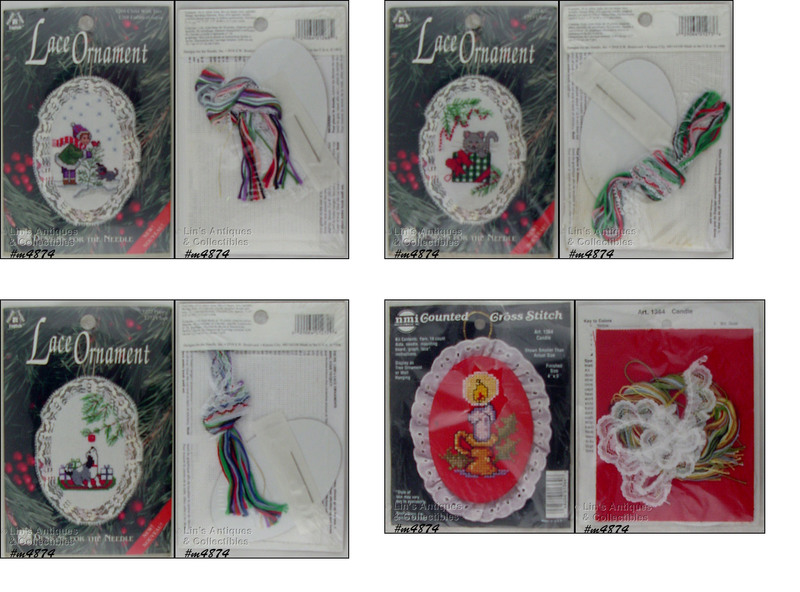 HERE IS AN ASSORTMENT – POLAND, GERMANY, ITALY – ALL ARE INDENT/REFLECTORS! THE ITALY ORNAMENTS ARE NOT MARKED ON CAPS BUT COLLECTORS CAN EASILY PICK THEM OUT. THEY'RE THE 3 SILVER ONES WITH THE VERY BRIGHT COLORS IN THE REFLECTOR/INDENTS. I HAVE COLLECTED A VERY LONG TIME AND HAVE HUNDREDS OF ORNAMENTS IN MY COLLECTION -- ONLY ITALIAN ORNAMENTS HAVE THESE BEAUTIFUL VIVID COLORS. THERE ARE 7 ROUND SHAPE, 4 TEAR DROP SHAPE WITH END POINTS, AND THERE IS ONE THAT HAS AN INDENT/REFLECTOR ON BOTH SIDES WITH A TEENY, POINTED, DELICATE END. THESE ARE IN AN ORIGINAL FANTASIA BOX BOTTOM BUT THE TOP WAS MISSING SO I PUT A NEWER TOP/LID ON TO HELP PROTECT THE ORNAMENTS DURING STORAGE. ORNAMENTS ARE GORGEOUS WITH A FEW DARK DOTS AND SOME COLOR DARKENING AT TOPS – THAT’S IT! ANOTHER GROUP OF ORNAMENTS FROM MY EXTENSIVE CHRISTMAS ORNAMENT COLLECTION! THERE ARE 6 IN THIS LISTING AND THEY ARE IN THE ORIGINAL BOX! THESE WERE MADE FOR AND SOLD BY SEARS – BOX HAS LABEL “SEARS, STOCK NUMBER 93345, SELLING PRICE (BLANK), SEARS, ROEBUCK & CO, CHICAGO, ILL”. THESE ORNAMENTS ARE A LARGER SIZE AND THEY ALL HAVE WEST GERMANY STAMPED ON THEIR METAL CAPS. THEY HAVE SOME NORMAL COLOR SEPARATIONS – NOTHING DRASTIC AND NOT AT ALL DETRIMENTAL TO THESE ABSOLUTELY BEAUTIFUL AND DIFFICULT TO FIND ORNAMENTS – SEE PHOTOS. YOU’LL LOVE THESE! I HAVE DECIDED TO LIST SOME ORNAMENTS FROM MY PERSONAL COLLECTION – I HAVE COLLECTED VINTAGE GLASS ORNAMENTS OVER 40 YEARS – TIME TO PART WITH SOME AND LET OTHERS ENJOY THEM AS I HAVE FOR SO LONG. THIS LISTING IS AS I PURCHASED IT AT AN ESTATE SALE. THERE ARE 5 ABSOLUTELY BEAUTIFUL WEST GERMANY INDENT/REFLECTORS AND ONE POLAND. THE POLAND IS THE ONE WITH PINK COLOR DOTS AROUND THE INSIDE EDGE. 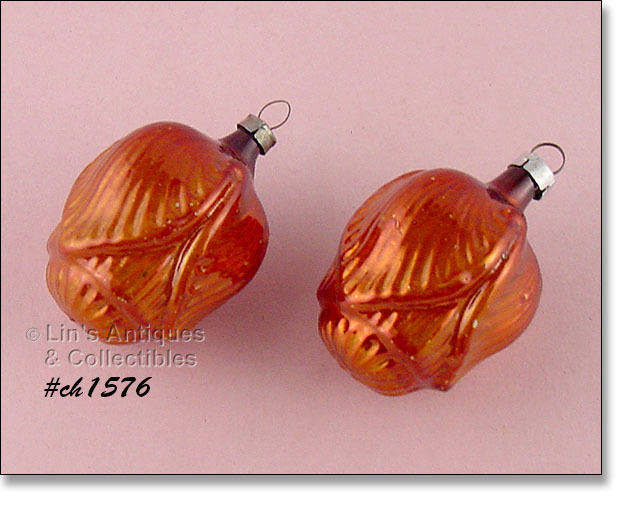 ALL ORNAMENTS (ESPECIALLY THE WEST GERMANY) ARE OF THIN, DELICATE GLASS AND THE COLORS ARE SIMPLY OUTSTANDING! THERE MAY BE A LITTLE DARKENING AT TOPS (CAUSED BY THE TOPS/HANG LOOPS) BUT THAT’S IT! THESE ORNAMENTS ARE VERY SPECIAL – CONDITION IS SUPER! THE ORIGINAL BOX HAS THIS: “STANDART – CHRISTBAUMSCHMUCK, 1 KTN 5076, 6 STUCK, MADE IN WESTERN GERMANY”. THE ORIGINAL PRICE OF $1.25 BOX IS HANDWRITTEN ALONG WITH ANOTHER PRICE OF 63 CENTS – I SUPPOSE THEY WERE REDUCED TO HALF PRICE WHEN NEW – WOW!!! SET OF 3 BEAUTIFUL PORCELAIN ORNAMENTS IN THEIR ORIGINAL BOX WITH CERTIFICATE OF AUTHENTICITY! PER C.O.A., THIS IS “THE FIFTH ISSUE IN THE LENA LIU’S FOREVER FLOWERS HEIRLOOM PORCELAIN ORNAMENT COLLECTION”. THE FLOWERS ARE “PANSIES, HYDRANGEA, AND PETUNIAS”. GORGEOUS!! FROM THE INDIANA SALE, THIS LISTING HAS ASSORTED MINI BERRY SHAPED ORNAMENTS IN THE ORIGINAL “I LOVE YOU THIS MUCH” BOX BY WALLACE BERRIE & CO. AND RUSS BERRIE & CO. THERE ARE 7 RED BERRIES, 2 PUMPKIN COLOR BERRIES, AND 1 GREEN COLOR BERRY. ALSO INCLUDED ARE 2 PUMPKIN COLOR WALNUT SHAPED ORNAMENTS AND 2 DROP SHAPED BERRIES WITH FLOWER BLOOMS ON THEM. A TOTAL OF 14 ORNAMENTS. NEAT ITEMS! THIS LISTING HAS SUPER NICE SHINY BRITE ORNAMENTS IN THE ORIGINAL BOXES! THESE ARE “AMERICAN MADE MINIATURE ORNAMENTS”. ONE BOX IS COMPLETE WITH 12 ORNAMENTS, THE OTHER BOX HAS 10 ORNAMENTS (2 ARE MISSING). THESE ARE VINTAGE ORNAMENTS, THEY DO NOT HAVE METAL CAPS, THE METAL HANG TOP JUST FITS INSIDE THE ORNAMENTS. SOME OF THE ORNAMENTS HAVE DARK DOTS (NOT UNUSUAL) AND THERE ARE SOME VINTAGE (HEAVIER WEIGHT) HANG HOOKS UNDER THE CARDBOARD INSIDE THE BOXES. NEAT ORNAMENTS, NEAT COLLECTIBLES. THIS PAST SUMMER, I PURCHASED SEVERAL VINTAGE ORNAMENTS AT AN INDIANA SALE WHERE THE OWNER WAS DOWN-SIZING (MOVING INTO AN APARTMENT). MANY OF THE ORNAMENTS WERE GROUPED TOGETHER BY THIS OWNER AND I WILL BE LISTING THEM TOGETHER. THIS LISTING IS ONE OF THOSE GROUPINGS. IN A SMALL BOX, THERE WAS A THIN GLASS TREE TOPPER WITH REFLECTOR/INDENTS. IT IS SILVER COLOR AND AS WITH MANY VINTAGE SILVER COLOR ORNAMENTS, IT HAS LOST SOME COLOR AND HAS SOME DARK DOTS. THERE IS NO DAMAGE TO THE INDENTS/REFLECTOR AREA. TOPPER MEASURES 9” TALL. THE OTHER ITEM IN THE BOX IS A RED OWL ORNAMENT. ALTHOUGH A LITTLE IMPERFECT, I’M CERTAIN IT IS A DIFFICULT TO FIND ITEM. THE IMPERFECTION IS THAT IT IS A CLIP STYLE ORNAMENT THAT HAS LOTS ITS’ CLIP AS WELL AS THE FIBER TAIL. THESE COULD BE REPLACED TO RESTORE THIS ITEM TO ITS’ ORIGINAL SPLENDOR! THIS ORNAMENT WAS NOT DISCARDED BY PRIOR OWNER AND IT MUST HAVE BEEN TREASURED BECAUSE IT HAS A GREEN COLOR THREAD TIED AROUND ITS NECK SO IT COULD BE HUNG ON A CHRISTMAS TREE. NEAT ITEMS! I’VE GROUPED THESE VERY COLLECTIBLE CHRISTMAS ORNAMENTS INTO ONE LOT! THERE IS A ROUND SILVER GLASS ORNAMENT THAT AT FIRST GLANCE, APPEARS TO BE SOME SORT OF BERRY – EXCEPT IT HAS IN-MOLD LITTLE FLOWERS. THE OTHER ORNAMENT IS A RED BRUSH WREATH ACCENTED WITH GLASS BEADS, A RED BOW, AND A SANTA FACE. LAST IS A HOT PINK COLOR SMALL SIZE TREE TOPPER. IT MEASURES 6 ½” TALL AND HAS A FEW DARK DOTS AND ONE AREA (ON STEM) OF COLOR LOSS THAT APPEARS TO HAVE COME OFF WHEN A PRICE STICKER WAS REMOVED. NICE GROUPING! REALLY NEAT GLASS BIRD SHAPED CLIPS/ORNAMENTS! THERE ARE TWO IN THIS LISTING – ONE MEASURES 3 ½” LONG (TAIL ADDS ANOTHER 2”), THE OTHER ONE IS 2 ½” LONG AND HAS LOST THE ORIGINAL SPUN GLASS FIBER TAIL (A PRIOR OWNER REPLACED WITH YARN). NEAT ITMES WITH VERY LITTLE COLOR LOSS! 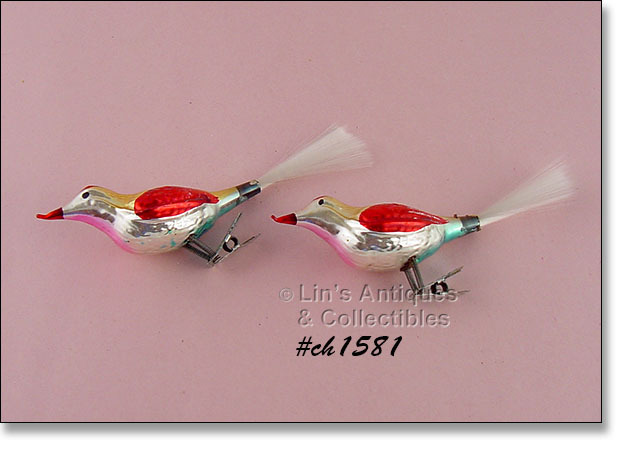 I’VE GROUPED THESE GLASS BIRDS INTO ONE LISTING BECAUSE THEY’RE THE SMALLER SIZE BIRDS. THEY MEASURE 2 ¾” LONG WITH TAILS ADDING AN EXTRA 2”. SUPER CONDITION! 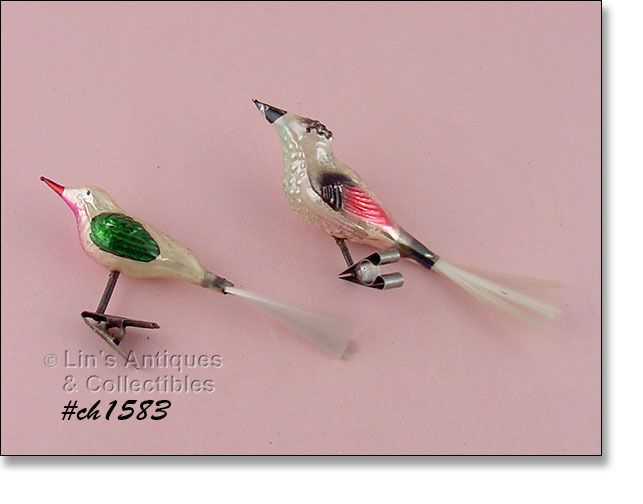 VERY NICE PAIR OF VINTAGE GLASS BIRD SHAPED CLIPS/ORNAMENTS! THEY MEASURE 3 ½” LONG AND THE TAIL IS AN ADDITIONAL 2”. THESE HAVE INTERESTING BEAKS – THEY ARE TURNED UP AT THE TIPS – UNUSUAL. NEAT ITEMS WITH VERY MINOR COLOR LOSS. 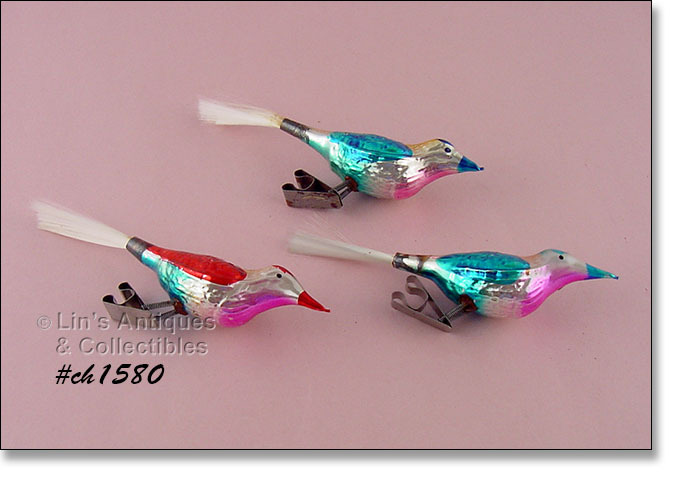 THIS LISTING HAS 3 GORGEOUS GLASS BIRD SHAPED CLIPS/ORNAMENTS! THEY MEASURE 4” LONG (NOT COUNTING TAILS) AND ARE IN SUPER CONDITION! THIS LISTING HAS 16 DIAMOND RAY METAL ICICLES IN THE ORIGINAL BOX! PER BOX, THERE ARE 16 IN PACKAGE (AND THERE ARE). SOME OF THE ICICLES LOOK NEW AND SOME HAVE SOME PITTING. SOME STILL HAVE STRINGS ATTACHED AND SOME DON’T. NICE LISTING, NICELY PRICED! 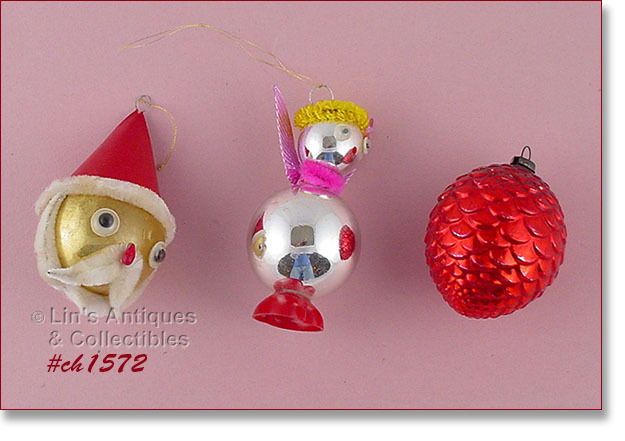 THIS LISTING HAS 3 VINTAGE GLASS ORNAMENTS! AT FIRST I THOUGHT THEY WERE CORN BECAUSE IT LOOKS LIKE CORN KERNELS BUT IT’S SORT OF ACORN SHAPED SO I’M NOT CERTAIN. THEY MEASURE 2 ¼” LONG AND ARE IN WONDERFUL CONDITION WITH MINOR COLOR LOSS. CORN OR ACORNS? STILL CUTE! 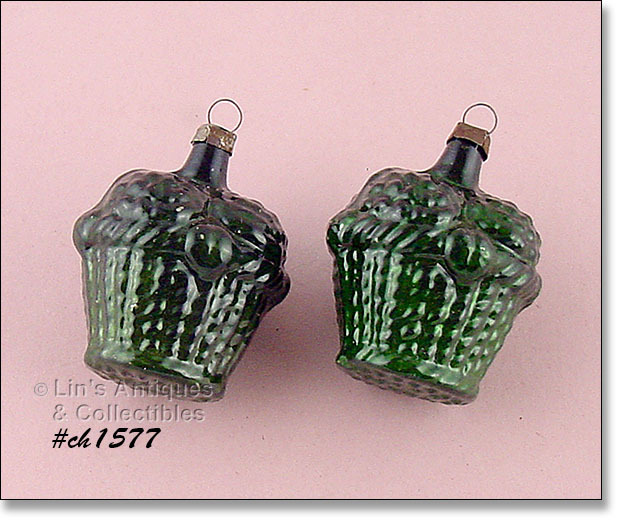 BEAUTIFUL DARK GREEN COLOR ON THESE TWO VINTAGE GLASS ORNAMENTS! THEY’RE SHAPED LIKE BASKETS OF FRUIT – OR FLOWERS, DIFFICULT TO DETERMINE—WITH AN IN-MOLD HEART ON THE BASKET. MEASURE 2” LONG AND ARE IN SUPER CONDITION – ONE ORNAMENT HAS A FEW TINY FLECKS OF MISSING COLOR – THAT’S IT! THESE ORNAMENTS ARE MADE OF FINE, THIN GLASS. ABSOLUTELY BEAUTIFUL GLASS ORNAMENTS SHAPED LIKE TULIPS! THERE ARE 2 IN THIS LISTING, BOTH ARE A VERY PRETTY BRONZE OR PUMPKIN COLOR, AND MEASURE 2 ¼” LONG. SUPER ADDITION TO A VINTAGE ORNAMENT COLLECTION! WOW – ANOTHER TREASURE! THIS LISTING HAS 12 VINTAGE GLASS ORNAMENTS STILL IN THE ORIGINAL BOX. THEY MEASURE 2 ¾” LONG AND ARE IN WONDERFUL CONDITION. ONE SILVER COLOR IS ALMOST CLEAR AND THERE IS VERY MINOR COLOR LOSS ON ONE PINK ONE. A FEW OF THE METAL CAPS HAVE GREENING AND WILL EVENTUALLY NEED TO BE REPLACED. THIS IS AN OUTSTANDING ORNAMENT LISTING – YOU’LL LOVE THESE! THIS LISTING HAS 24 METAL SPIRAL TWIST ICICLES BY NATIONAL COMPANY! THERE ARE 3 BOXES AVAILABLE, PRICED $60 PER BOX . 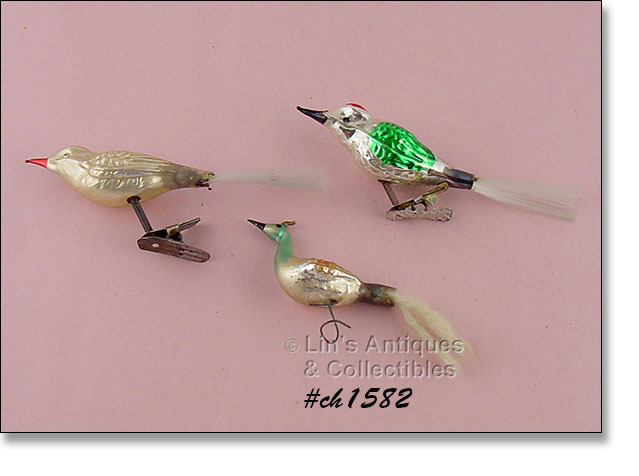 A SUPER NEAT VINTAGE ORNAMENT LISTING – A LARGE BIRD AND 2 LITTLE ONES! THE BIG ONE HAS A RIBBON AROUND ITS’ NECK FOR HANGING, THE 2 LITTLE ONES HAVE THE ORIGINAL STRING HANGERS. CUTE AND VERY COLLECTIBLE! 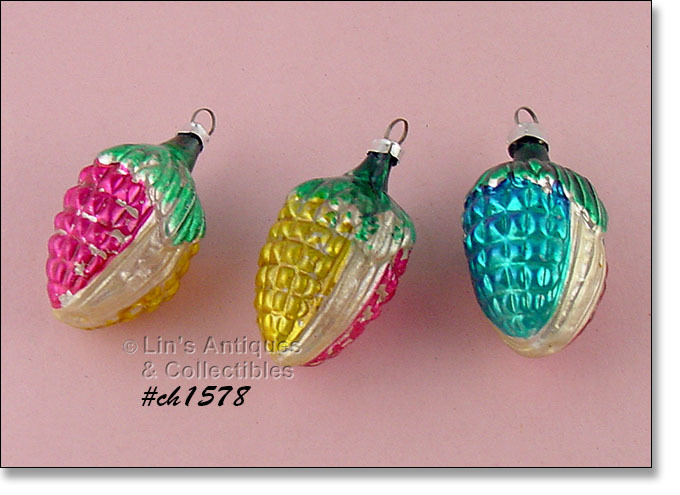 I’VE GROUPED THESE 3 VINTAGE GLASS ORNAMENTS INTO ONE LISTING! THERE’S A RED PINECONE – PRETTY WITH VERY MINOR COLOR LOSS. THERE’S A SANTA – ALSO WITH MINOR COLOR LOSS THAT IS NOT UNUSUAL ON THESE OLDER ORNAMENTS BECAUSE THE COLOR IS INSIDE, NOT ON THE OUTSIDE. AND LASTLY, THERE’S A REALLY NEAT ANGEL ORNAMENT – EXCELLENT CONDITION (WINGS ARE STAMPED JAPAN ON BACK). SUPER ORNAMENTS, NICE ASSORTMENT! THIS LISTING HAS TWO GLASS HORN ORNAMENTS! THEY ARE IN VERY GOOD CONDITION WITH SOME COLOR LOSS – SEE PHOTO. NICE ORNAMENTS, NICELY PRICED! I USED TO COLLECT THESE PINE CONE ELVES BUT DECIDED ONE PERSON CAN ONLY COLLECT SO MUCH – SO I’M LISTING THESE! THERE ARE 12 PINE CONE ELF ORNAMENTS – 8 HAVE PINECONE “BODIES” AND 4 ARE SITTING ON MINI PINECONES. ALL ARE IN VERY GOOD TO EXCELLENT CONDITION. WHAT A TREASURE! THIS LISTING HAS 1 DOZEN GRAPE CLUSTER SHAPED GLASS ORNAMENTS. THEY MEASURE 1 ½” LONG, 1 ¼” WIDE, ARE IN ASSORTED COLORS, AND THE BEST PART – THEY ARE STILL IN THEIR ORIGINAL BOX WITH OCCUPIED JAPAN LABEL ON ONE END. AS TO BE EXPECTED, THERE IS SOME MINOR COLOR LOSS BUT I DO NOT BELIEVE IT DETRACTS FROM THESE ORNAMENTS. THEY HAVE THE STRING/THREADS ON THE METAL HANG LOOPS – PUT THERE BY A LONG AGO OWNER. BOX IS IN VERY GOOD CONDITION WITH ONE END FLAP BEING TAPED. DON’T MISS THESE!